An English speaking eleven year-old boy from Cebu city, Kyle Echarri, is the first to be included in TEAM SARAH in the second season of THE VOICE KIDS Philippines. He was accompanied by his mother as he sang his rendition of “Night Changes”. The two coaches, Coach Bamboo and Coach Sarah turned their chairs for him. Though, he is quite nervous while singing his audition piece Coach Sarah promised to help him build more his confidence and improve him as an artist/performer. On the other hand, Coach Bamboo promised to play soccer with him and help him be more comfortable performing. In the end, he had chosen Coach Sarah to be his Coach. He said he knows Coach Sarah more that is why he chose her. He was given a necklace with an “S” pendant by his coach, Sarah Geronimo. Aside from his singing talent, he also loves to play football/soccer. Romeo Espina belted out “Hesus” in The Voice Kids 2 Philippines. This nine-year old boy from Tondo, Manila who sang “HESUS” in his audition in The Voice Kids 2 Philippines, can impersonate different singers. Romeo wants to show his talents to the world and he had given them samples of his impersonation of Jaya, Jessa Zaragoza and Coach Bamboo. 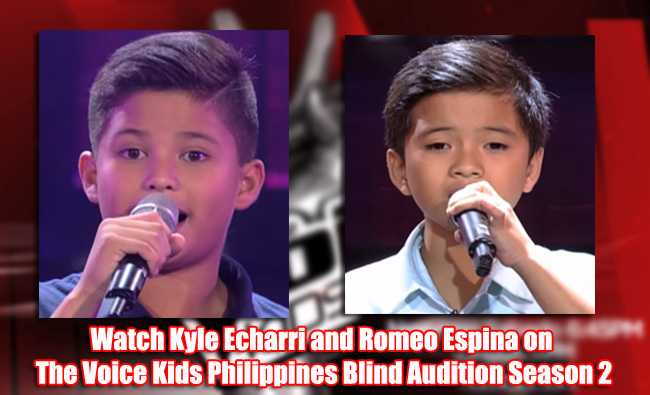 Two Coaches turned for Romeo as he sang his audition piece “HESUS”. He was accompanied by his mother and relatives and the crowd went loud cheering for him as he belts “Hesus”. Sarah Geronimo said he will teach him to control his singing voice and in choosing the right type of songs. Meanwhile coach Bamboo turned for Romeo’s angelic voice and said that he should maintain his ‘natural voice’ because it sounds more interesting for him. In the end he had chosen Bamboo as his coach and he was given a scarf to be his identification in Camp Kawayan.